Rare summer resident permit overgrowth of weeds onthe site. Experienced growers and gardeners know that there is no benefit from weeds and damage - a lot. Weeds take nutrition and moisture in crops, releasing toxic substances into the ground. Get rid of the "uninvited guests" at the site trying all gardeners weeding beds and flower beds throughout the summer period. However, weeds do not give up and come back after each weeding. Especially hard to deal with perennial weeds, breeding rhizomes creeping shoots or multistage root suckers. Previously, such "contagion" were taken from the site with the help of a black plastic film, cardboard sheets, old floor coverings and other materials impermeable to sunlight. Now manufacturers of goods for gardening work, offer cottagers use non-woven covering material from weeds that can allow air and water, but retaining the sun's rays. How to use the cover material? Black or two-tone agrovoloknom material? Agrovoloknom or film: it is more profitable? Each group shall have a specific set ofproperties and characteristics that affect the use of this method for a covering canvas. 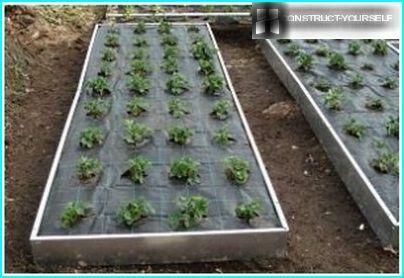 For example, light cloths having low density, cover the beds to protect seedlings from frost. Growing seedlings raised weightless stuff their tops, while remaining a reliable shelter from adverse climate phenomena. The weed help nonwoven webs of the fourth group, which have the highest density and have a black color. Due to the dark color of the material retains sunlight, accumulating fine with the heat. These properties determine the main purpose of the application of non-woven fabric, consisting in mulching beds. Mulching agrovoloknom relates to nonwovenpolypropylene materials that do not cause any harm to grow plants, no animals, no people. This agrovoloknom not give any chance to the weeds that are dying from lack of light, trying to break through the dense material. The density of mulch covering materials is 50-60 grams per square meter. 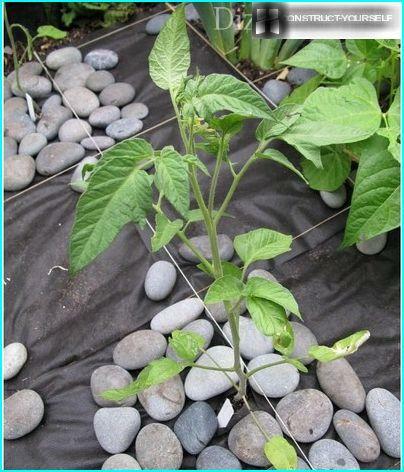 seedlings are planted in a cross-shaped slot made in a covering cloth peg or sharp cutting object. Amateur gardeners, as well as farmers engaged ingrowing fruits and vegetables on a large scale, are exempted from the need to purchase and use of herbicides against weeds. 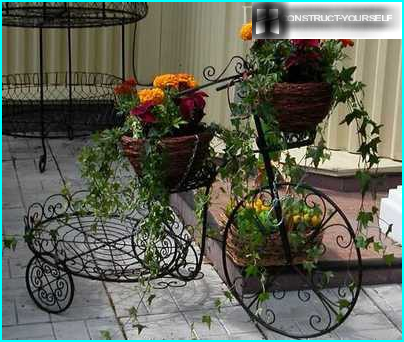 Also, they do not have to be lost to suburban areas with hoes, spending a lot of physical effort and time for weeding. Weeds are simply not. Exactly rows only useful crops are grown. In addition, the fruits stay clean after the rain,since they do not come into contact with the ground. Strawberries grown on ridges covered agrovoloknom can be immediately collected after rain. The berries are dry cloth and have a wonderful presentation. They can bring to the table, lightly rinsed dust, or take on the market for sale. Using agrovoloknom mulching black color, you can achieve an earlier ripening. 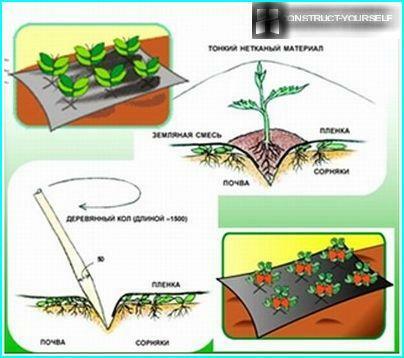 Reduce the period of growing crops to two weeks is possible due to early warming of the earth, under the shelter. The range of covering materials appearedinteresting novelty - two-tone agrovoloknom mulching, better than the usual black fabric functionality. Manufacturer of refined products, combining two thin layers of white and black. 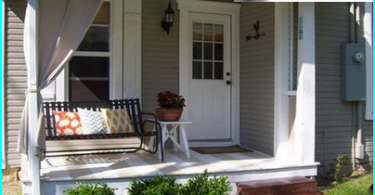 As a result, one side covering material has a black color and the other - white. Dark side of the canvas is laid on the ground, and the light is on top of the surface and reflects the sunlight that falls on plants and fruits from the bottom, accelerating their growth and aging. Important! The white surface mulch two-color agrovoloknom does not cool the root system, which affects the rate of growth of cultivated crops in the area and uniformity of fruit ripening. It inhibits the growth of weeds between the rows, cutting labor costs. Most modern mulching materialsdesigned for service in a few seasons. For example, the coating material mulch on weed AgroLyuks company may be in the area from one year to three years or more. When growing strawberries or strawberry isprofitable, because after a certain time interval planting need to be updated. 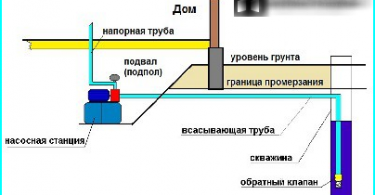 At this point, changing and covering material because of the old web resource is produced completely. Length of service coverlet fabric depends on the presence in its composition UV stabilizer, protecting the non-woven material from the damaging effects of ultraviolet radiation. To track laid on the territory of the garden,always had a neat appearance, you must use a mulch covering material. This fabric will prevent germination of weeds between the individual elements of the track. Since the nonwoven fabric is capable of flowing water, the puddles on the track after the rain you will not find. All the moisture is absorbed into the ground, after passing through the mulch material. After dredging the bottom of the trench aligned and tamped. Then spread a spunbond, agrospan some inexpensive form of covering material, he fell asleep gravel, bark, expanded clay, decorative stone or gravel simple. Similarly, decorate tree trunks of fruit trees. 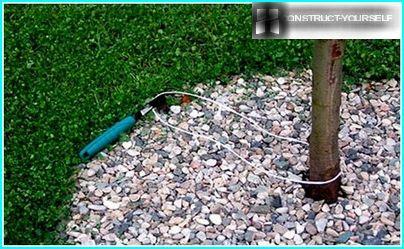 Wherever there is a probability of germinationunwanted grass, it is necessary to lay a non-woven covering material in black. This will solve the problem of the emergence of weeds once and for all. Proper use of a covering nonwoven webs increases the attractiveness of the site.